For first-time trips, best spots, caravanning as a family and the latest technology tips, check out Editor Giulia Heppell's exclusive insights. What is it about Caravanning holidays that has people hooked? Caravanning offers travellers the ultimate freedom on their holiday. They can go wherever they please whenever they like! There isn’t the fuss of hotel bookings, strict time lines, rental cars and all of the expenses that come with it. Plus, caravanners know that holidaying is as much about the journey as the destination. Australia has such diverse and stunning landscapes, and holiday-makers miss out if they’re travelling by plane. Who is Caravanning Australia magazine for? The debut Caravanner? The seasoned? ’t need a caravan to love Caravanning Australia. Whether you’re planning a quick daytrip, heading out on a four-wheel drive adventure, packing up the car for some camping or setting out on a huge caravanning expedition, we’ve got you covered. Even those who think they’ve seen it all will learn about new locations, tips and tricks for their travels. What trip/s might you recommend to a first-time caravan holiday-maker? If it’s your first caravanning adventure, it’s best to start small. Whatever state you’re in, there will be plenty to see just around the corner! Until you’ve figured out how you like to travel, what you need to pack and which tools you need to bring, it’s best to stick to familiar territory. Chances are you haven’t explored your own region properly anyway! If you’re thinking that tight spaces and big families don’t make for a happy match, think again! Family holidays are much more fun – and much less expensive – when you’re caravanning. You’re afforded that little bit of extra freedom, so you can cater to everyone’s tastes and move from, say, a sunny beach location in the morning to a mountainside camping spot in the afternoon. The extra bit of storage space means you can pack the boogie boards, the bikes, the board games and whatever else you need to keep the crew entertained. Technology has made the caravanning experience nothing short of glamorous. You’re able to take most of the comforts of home with you, with wi-fi, satellite TV, top-notch security systems and plenty more available to keep you cosy. Technologies such as solar power and ultra-smart batteries have also made these more luxurious holidays more affordable and sustainable. Are some of the best holiday spots in Australia exclusive to Caravans and campers? e.g. There are so many spots you can only get to if you’re camping or caravanning – beaches, nature parks, outback reserves and plenty more! It’s no question that the best holiday spots are reserved for those who can move around more easily. If your holiday budget is tight, you’ll see that the flexibility of camping allows you far more travel freedom than a pocket full of cash ever could! Every issue of CA has a hero theme 'Summer's Best Beach Drives' and 'The Outback' and the issue is broken up into smaller stories by each State, it seems there are endless possibilities when it comes to holidaying by caravan? Caravanning Australia has you covered for the top travel routes in each state for every season – you couldn’t ask for a better holiday guide! There are endless possibilities when it comes to caravanning around Australia, which can be overwhelming, so having a bit of help deciding where to go next could never go amiss! Your loved ones, plenty of good food and your favourite copy of Caravanning Australia. Of course, there are plenty of other essentials to pack, such as your itinerary, a maintenance toolkit for your caravan, a satellite navigation system, a first aid kit and enough clean drinking water to get you between stops! What makes CA magazine different from other Caravanning and travel magazines? 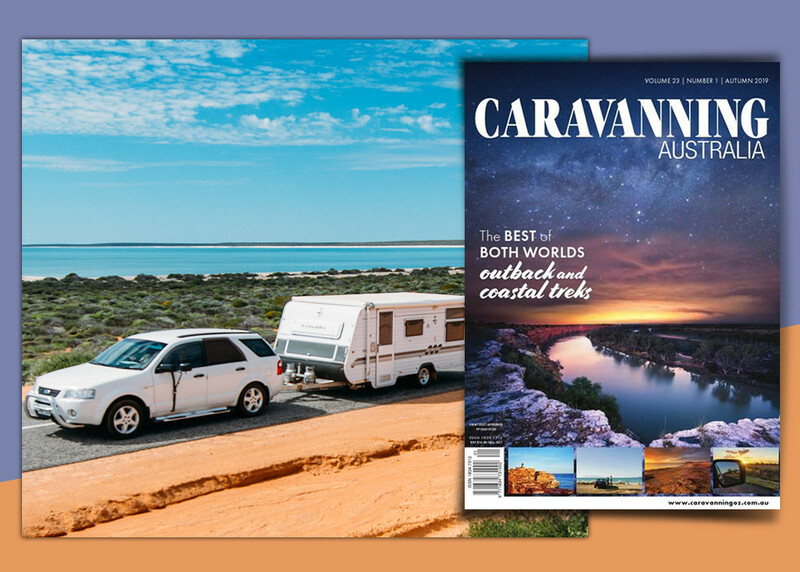 Caravanning Australia is a print magazine, so it’s the perfect way for travellers to keep a friendly travel guide with them all the time, even if they’re heading off grid! It’s the only Aussie travel magazine with advice just for caravanners and campers, so it can’t be passed up for the keen mobile holiday-maker! What's the advantage of subscribing to Caravanning Australia magazine? Subscribing to Caravanning Australia is the best way to make sure you’re getting all the best info. We don’t share all of our best tips and locations online – it’s all saved for our loyal print readers!